There is fine line between a brilliant idea and a fast-selling one. This is especially true when it comes to mobile game development as it is a fiercely competitive market. Several developers launch new and visually compelling cross-platform games regularly. Therefore, you need all the latest tools and frameworks for standing out from the rest. Your code needs to be all-purpose and your application must be worthy of millions of downloads. To transform your mobile game ideas into reality, it is wise to seek help from trustworthy mobile game development services. Our dedicated team of experts at Tech Support Dubai work day and night for developing the best possible solutions as per your requirements. We have all it takes to help you develop and promote your mobile game application. We also provide consultations when it comes to allocating your project’s budget. Feature Creep: If your game becomes saturated with unnecessary features and ideas, it can quickly disengage your clients. It normally happens when your priority diverts from the target audience and your core offering. Improper Monetization Policies: There is more than one way to monetize your mobile game application and often, so many options can confuse developers. You can enable free as well as paid subscriptions after thorough research on the existing market policies. User Retention: This is certainly a nightmare for mobile game developers. With so many options at hand, the target audience often loses interest in a particular game and this drastically affects the sales. Promotion and Acquisition: Even the best ideas might remain under covers if you do not promote it. While several developers excel at creating fantastic codes, they lack expertise in branding and marketing. In addition to the list mentioned above, raising funds and investing in a proper security system are equally essential. With advanced knowledge and expertise in the mobile game development system, we help our clients develop engaging and robust game applications. Our engineers will guide you throughout the process and will also provide you with valuable marketing tips. With our best-in-class services and in-depth knowledge of game analytics, your mobile game applications will be ready in no time. We can assist you in HTML mobile game app development. If you want to create games for platforms like Windows and iOS, we can take care of that as well. Our professional mobile game developers have excellent frameworks suitable for creating 2D and 3D games. Also, our experts know how to code sports games including cricket, baseball and football. 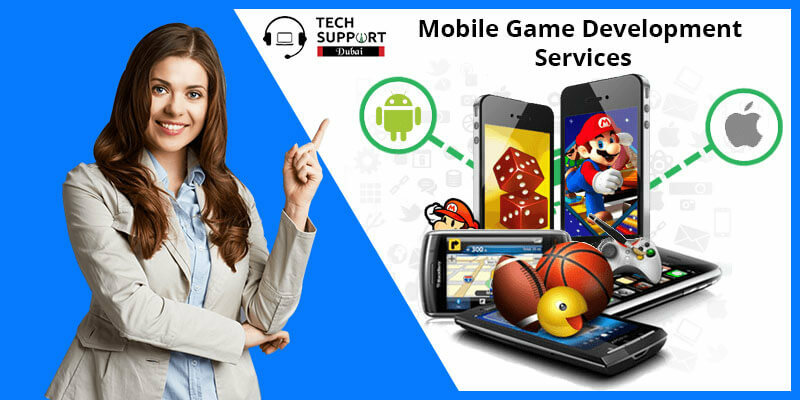 Apart from that, our engineers at Tech Support Dubai can also help you develop mobile games meant for Facebook along with creating multiplayer and multi-level games. Call us at 042053349 and get in touch with our tech specialists. As the leading mobile game development company, we will certainly provide the best value in return for your money. Therefore, have faith in us and let us help you make a mark in this industry. Reach us and avail fantastic solutions in your budget. You can also reach us through other facilities such as email and live chat. We also provide HTML 5 game development service in Dubai.